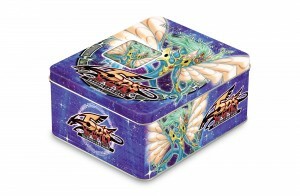 In the remaining 5 months of 2009, Konami Digital Entertainment will be releasing eight “collectible tins,” including four “limited distribution exclusive tins,” for the Yu-Gi-Oh! card game. The first two, available now, feature Power Tool Dragon and Ancient Fairy Dragon and come with two booster packs of Crimson Crisis, one pack of Raging Battle, two sneak-peak packs from the upcoming set Ancient Prophecy, a Secret Rare variant monster card, and a package of branded card sleeves. All for only 20 bucks—because I’m sure you’ll buy just one.